The Mayans were highly professionals in Astronomy. They defined a long time cycle of 1,872,000 days . It occurs between two periods where considerable changes happen to Earth. By dividing by 365.25, historians translated such a number of days into 5,125 years. I believe that such as resultant number of solar years is incorrect. The Aztecs believed that a new cycle could be born on a 52-year boundary count. They used to run a grand festival every 52 years in anticipation of the birth of a new Sun. That can only be realized, if Earth stops spinning about its axis for some time and the night grew longer than normal for a couple of days. As the Earth starts to spin again, the Sun (called a new Sun by the Aztecs and the Mayans) reemerges in the sky and assumes its normal course. Therefore, it is expected that the Mayan long cycle be divisible by 52 without a remainder. When we divide 5,125 year by 52 years, we get 98.56 (i.e there is a fraction remainder!). Joseph Goodman who first deciphered the Mayan Calendar must have overlooked the Aztec record of 52-year boundary count. I explained earlier that there were times when the rotation of the planet about its axis went slower than our current times. What if on 1,597 BC, the great eruption of Thera (Santorini) and the Exodus of the sons-of-Israel from Egypt occurred, and 52 years later on 1,545 BC the Sun and the Moon stood still during Joshua’s war? The short cycle of Earth changes would be 3,562 years. The Mayan ‘long’ count of 1,872,000 days would be twice as long. What if we divide the Mayan long cycle into two periods of disparate number of days but equal number of years; 1,301,020 days of 365.25 days per year, equivalent of 3,562 years, and 570,979 days over 3,562 years resulting in 160.30 days per year, equivalent to 13- day months, a number the Mayan used to cherish and live by. Upon dividing Mayan long cycle of 7,124 years by 52, we get 137 (an integer number without a remainder) which conforms with what the Aztec believed, that a new cycle of the Sun could be born on a 52 year boundary interval. In other words the Mayan long cycle started 5,107 BC and could complete in 2017 AD. This means that no Earth changes to occur on December 21st 2012 AD. If the Mayans are right, a cycle ends and a new one begins in 2017 AD. The Avestic Aryans of Iran, who lived from 8,000 BC, spoke of three epochs  of creation prior to our current one. The first of which witnessed sudden and drastic climate change that turned the climate in which they lived from 5 months of winter/ 7 months of summer to 10 months of winter/ 2 months of summer and that length of day and night was long. If we assume that the Avestic Aryans had lived in the centre land of current Iran, this meant that before the commencement of the first epoch a magnetic pole, where an Ice Cap resided, must have been located within some 3,600 km (2,250 mile) distance (Continental Belt) from the centre of Iran. Given that some 10,000 years ago there was no trace of Reversed Magnetic Field (Plasmoids) in Antarctica, the planet must have been spinning very slowly about its axis to the extent that Inner Core emitted electrons flew in straight lines in the molten Outer Core and therefore no induced magnetic force was generated. For the planet to spin slowly, the gap angle between Earth magnetic axis and the axis of rotation must have been close to 90°. Plotting the distance and the gap angle, means that such a magnetic pole must have resided somewhere in India main land or Indian Ocean at 5°N latitude. Applying the same logic after the commencement of the first epoch, we can confirm that the magnetic pole, where a new Ice Cap formed, must have been relocated within a Cold Polar Belt of some 2,600 km (1,625 mile) distance from the centre of Iran; that is somewhere in India at 15°N latitude. Since the two Magnetic Poles are not aligned opposite to each other on the surface of Earth and since each pole moves at a different rate and direction, it is not true that if one magnetic pole existed in India the other pole will be located in the Pacific Ocean west to Ecuador. Confusion exists over why the ice in Antarctica dates back, apparently for tens of thousands of years. Unlike the rings in a tree, which show its age, layers of ice do not show what is absent. Polar ice reflects only that portion of ice, which has not melted away. Many shifts are slight, thus causing partial melting or melting on only one side, If one analyses the last few shifts, it becomes apparent that the north magnetic pole in the southern hemisphere has moved slightly over Antarctica and nearby ocean. When an ice cap forms over water near land, the land mass retains ice under the influence of such large block of floating ice cap. The Toba Indians  of the Gran Chaco region that sprawls across modern borders of Paraguay, Argentina and Chile, in South America at 21°S latitude still repeat an ancient myth of a great cold period that was accompanied by a great darkness. As we reflect on the great cold over central Latin America, while the Antarctic ice kept intact some 10,000 years ago, or in other words the change from Continental Belt to Cold Polar Belt or from 3,600 km (2,250 mile) to 2,600 km (1,625 mile) closer to the magnetic pole, we find a possible location for the north magnetic pole to have been at 70.00°W longitude and 60.00°S latitude. But what caused such a movement of Inner Core magnet, as manifested by the relocation of its magnetic poles on the surface of the Earth? Was it the same ninth planet that was observed in the following epoch by Abraham? The Cahto Indians of California tell that amidst a great darkness, the Sun, instead of holding its course across the sky, seemed to speed crookedly overhead and to rush down in wrath like a meteor. The grass withered; the crops were scorched; the woods went up in fire and smoke. I believe that Earth spin about its axis had ceased and that the night grew longer over the western hemisphere as a consequence of the same planet that was observed by Abraham an epoch later. The Cahto Indians had mistaken the intruding planet for the Sun and they saw it moving as a meteor. I also believe that the magnetic pull of the inner core of such a planet has weakened the Earth magnetic field by directly pulling some of its force lines so that the magnitude and intensity of the total magnetic force lines circumventing the surface of the Earth became less. A weaker, less numbered magnetic field force lines results in the capture of Sun charged protons to gain higher speed and experience longer spiral-radius motions between the two magnetic poles of our planet. The increased collisions of sped, longer radius spiraling protons with one another at the Thermosphere layer generate higher thermal energy, which at a point in time became scorching enough to spark fire at dry woods and forests. The “Hour” is mentioned in the holy book of Qur’an. The “End of Days” is similarly mentioned in the Bible. The term refers to the time when severe turmoil takes people by surprise. Could it be that because when Earth’s spin slows down, the hour that we know to be sixty minutes will get longer? It currently takes twenty-four hours for the Earth to complete a whole revolution about its axis. Could it, at one point in time, take forty or sixty hours? The Earth could eventually cease to revolve or perhaps spins in the reverse direction. People will watch the Sun rising from the west. It might be exciting to some, but the scale of volcanoes, earthquakes, ashes in the air, gigantic tidal waves coming from ocean bed movements as well as recessed bulged ocean and ice caps sudden melting, will not let anyone to enjoy such a scene. Remarkably, Surat Al Qamar not only introduces a phenomenal event, the timing of which is consistent with astronomical events, but it speaks of the prophets in whose times the cycle of the mPlanet approaching the solar system had repeated itself. These were i) Noah, ii) the tribe of Lot, nephew of Abraham, and iii) the Pharaoh who reigned at the time of Moses. Each is respectively separated by 3,550 years more or less. The cycle features vary greatly. Whereas the short cycle is 3,562 years, we do not know for certain what is the number of days per solar year? What is the spin speed of Earth about its axis? What is the location of the magnetic pole, the Temperature Belts and the resultant Climates? Some 10,000 years ago there were no traces of Plasmoids (Reversed Magnetic Field at the Antarctica. This means that the spin speed as explained above was so slow that the electrons flowing in the outer core did not move in spiral paths and accordingly resulted in no induced magnetic field force. Where I denotes the cycle. As concluded on Change Cycle page of this site, the end of a cycle and a beginning of a new one could either be in August 2017 or August 2027. In our times the average human age is 80 solar years and each year is 365 days. 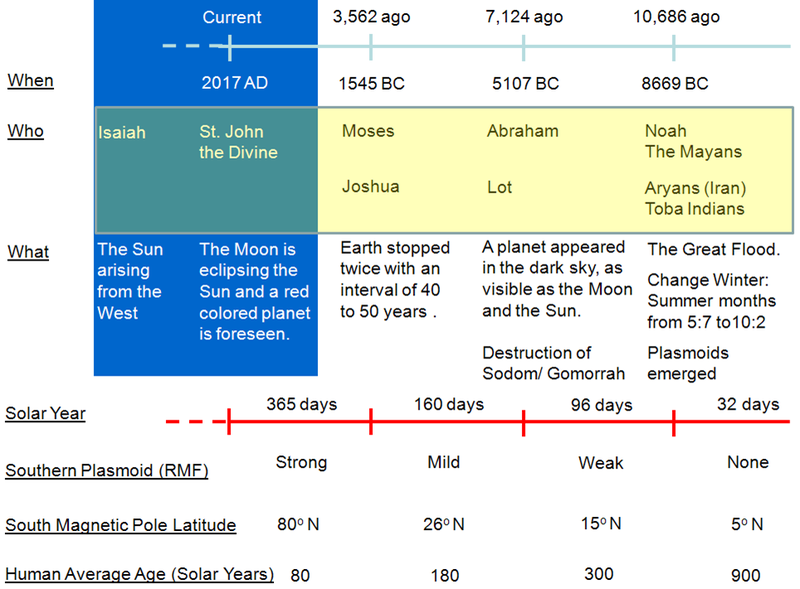 Some 10,600 years ago, during Noah’s time, the average human age was 900 solar years as mentioned in the Old Testament which means that each year was 32 days long, as we apply the Human Days/Life formula above. Upon applying the fixed ratio of cosine the Gap Angle between the Magnetic Field Force lines and the axis of rotation to the Human Average Age at current and 10,600 years ago epochs, we find that the south magnetic pole was situated at 5oN latitude as manifested in the Other observations from earlier civilizations section of this page. Adrian Gilbert, The End of Time- The Mayan Prophecies Revisited, 2007. Bal Gangadhar Tilak, The Arctic Home in the Vedas, 1903. Graham Hancook, Fingerprits of the Gods, 1995.